La chambre principale comprend tout le dernier étage rend très privé. Il dispose d'une terrasse privée, un lit king size, TV grand écran plat, lecteur Blue Ray, dressing, double vasque, grande douche et des toilettes privées. Une chambre a un lit king size et télévision à écran plat. La troisième chambre dispose d'un lit king. Jetez une ligne sur le quai, à pied de la plage, ou profiter d'un après-midi paresseux se prélasser dans la piscine chauffée. L'accès à Internet vous pourrez vous connecter à la civilisation .... et longue distance des appels gratuits aux États-Unis. Sommes-nous encore là? Se il vous plaît noter: jusqu'à ce que vous avez un contrat signé et dépôt effectué le propriétaire selon le contrat, votre réservation ne est pas complète ou confirmé. This was our 3rd year in a row staying at the Tipsy Turtle and what a beautiful oasis! We had 3 couples and stayed from mid February to mid March for 30 nights and we had wonderful weather. Nedra does a great job ensuring that her guests have everything they need during their stay. We have enjoyed all of the upgrades and amenities they have made over the past few years. 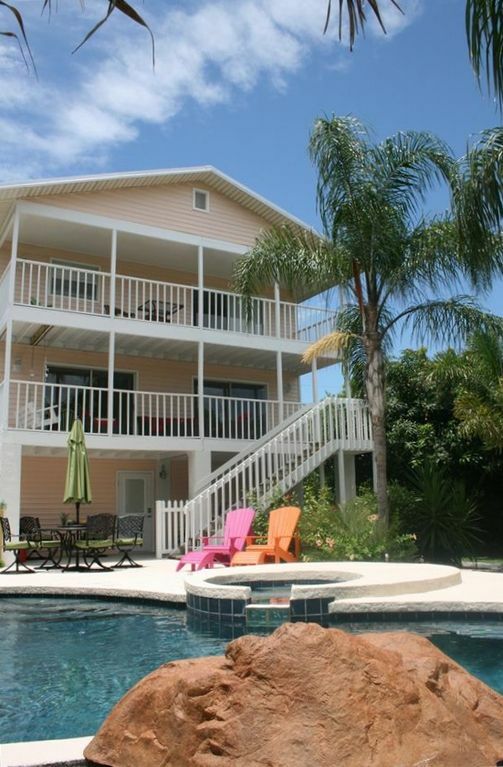 We love the location and all of the conveniences including the beach, resturants and shopping! This was our second visit to this gorgeous piece of property. We absolutely fell in love on our first trip and immediately rebooked with Nedra as soon as we returned from our visit. Upon arrival we noticed that the property has had significant upgrades and has undergone remodeling in the kitchen and outside pool areas, which were were all greatly appreciated. Here we thought that the Tipsy Turtle couldn’t get any better, well it has with these new additions. The newly remodled kitchen offers its guests with first class appliances and an abundance cutlery and cookware. The outside pool area is like its own private tropical paradise. One can really relax listening to the sound of the pool waterfall or simply soaking in the hot tub. What really makes this property shine is the small attention to detail. As a guest you have access to beach chairs, umbrellas, 4 adult bikes, pool rafts and loungers, you literally just need to show up and enjoy. The location of the property also adds as an extra bonus as well. It’s located on a quiet dead end street yet just a 5 min walk to the beautiful beaches of AMI. Thanks again Nedra for providing us the opportunity to enjoy your wonderful property. This is our second year staying at the Tipsy Turtle and we love it! This past year the kitchen was completely and beautifully remodeled as well as new flooring throughout. The pool and patio were also redone. We really love the privacy of the backyard including the heated pool and hot tub. We used the new beach cart to walk 5 minutes to the golf of Mexico carrying chairs, cooler, umbrellas etc. The location on the northern end of the island is a convenient location to get to Pine Street, go for walk or for a bike ride which are included at the property. We used the BBQ 3-4 times a week. The beds, bedding and towels are all first class and little things like shampoo, conditioner and seasonings are included. We are looking forward to returning in 2019! We spent a fun pre-Easter week in this friendly island home. The location on the canal made exploring the waters by kayak a highlight. Our grandchildren loved seeing the manatees up close. Located on a dead end street, 3 blocks from the beach, the cheery home has every amenity. The lush tropical backyard has a heated pool, outdoor shower, and even a quaint "outhouse." Don't miss the donut shop or Ginny & Jane's, both easy walks. And The Waterfront, a favorite, has carry out. We will definitely be Back!